Which slide design tool should I use? This week’s Pitch Hack of the week is Which slide design tool should I use? If you’re putting together a pitch deck for the first time – whether it’s for investment or sales, or you planning to present it live or send it as a document to potential investors or potential sales clients – you’ve probably Googled “What is a pitch deck?,” or “What goes into a pitch deck?,” or “How do I build a pitch deck?”. You have a lot of different options for what tool to use when building a pitch deck. What you’re really doing is putting together a presentation. There are many different presentation softwares you can use. You may have some on your computer or found some online. The most common presentation software is PowerPoint. Everyone has heard of PowerPoint – it’s a staple of presentation design. Here at Pitch Deck Fire we use PowerPoint the most often. It has a lot of functionality and is very useful. Since most people are familiar with PowerPoint, clients can access the files we’re putting together very easily. You may or may not be familiar with PowerPoint. If you are, it’s probably a good tool for you to use. If you are using a mac you may use Keynote as well or instead. Keynote and PowerPoint are both good because they’re very functional and you can use them as a visual aid or a send-ahead document. Once you’ve created your presentation, you can make either document into a .pdf file to easily send to someone. They are great tools for someone who doesn’t have access to more intense design tools to be able to put together or edit or utilize more intense design and visual documents. There are several other online versions of tools you can use to create your presentation. They are newer tools that have different functionality you might find valuable over PowerPoint or Keynote. I’ve seen more people using Google Slides. That may be because Google Slides does have different functionality – it is very editable and it can be beneficial to have an entire team be able to provide input on one document at once. It’s also more likely to be able to have version control. The downsides to Google Slides are that it’s not as functional as PowerPoint or Keynote and it’s not as easy to be consistent with master slides, themes, colors, and fonts as it is in PowerPoint and Keynote. Some people use Slidebean, slides.com and Prezi. Each of these are a little different. Slidebean and slides.com gives a beneficial opportunity to see who is looking at your slides and for how long. This can be valuable if you’re sending your deck to an investor and want see what they think. Keep in mind – you can always upload documents you’ve created in other presentation tools to those sites. That way you still get the value without using their tool to put it together. These sites tend to be a little less user friendly and less functional than PowerPoint or Keynote. Prezi is an interesting site where pieces move around and you can zoom in and zoom out. I would be cautious of Prezi because it’s very easy to make things look complicated. You can almost make too much movement for your audience. Prezi doesn’t work well in live presentation because it makes people dizzy and you don’t want to make your audience dizzy – you want them to pay attention to you. It also doesn’t work as a pdf because you lose the movement. In conclusion, I suggest using either PowerPoint or Keynote. Or consider some of these other options if you’re looking for those specific benefits, but know you’ll lose some functionality in design and presentation ability. If you have any thoughts on presentation tools or other tools you think are very valuable I’d love to hear about them in the comments below. If this video has been helpful give us a thumbs up.  If you have any ideas for upcoming pitch hacks, submit them below for next week. Thank you so much for joining us for this week’s Pitch Hack of the Week. I’m Stacie with Pitch Deck Fire and we’ll see you next time. Happy pitching!